The Fraser's strong branches are turned slightly upward which gives the tree a compact appearance. Fraser Fir: The combination of form, needle retention, dark blue-green color, pleasant scent and excellent shipping characteristics has led to Fraser fir being the most popular Christmas tree species. 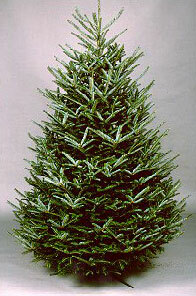 North Carolina produces the majority of Fraser fir Christmas trees. It requires from 7 to 10 years in the field to produce a 6-7 feet tree. Trivia: Fraser fir was named for John Fraser (1750-1811), a Scot botanist who explored the southern Appalachian Mountains in the late 18th century. The species is sometimes called Southern balsam or Southern balsam fir. Locally Fraser fir is known as "She balsam" because of the resin filled blisters on the tree's trunk. Red spruce, often associated with Fraser fir, is called "He balsam" and lacks the distinctive blisters.